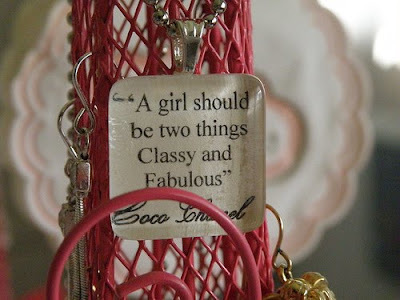 2 Days left for Chanel Necklace Giveaway !! Vera is from Rowlett, Texas and was kind enough to send me a necklace for a giveaway. It is a really great layering piece and very unique item. The chain is 24 inches and you could also put it on a cord if you have one at home. I like to make it easy for everyone. The contest will run from Sunday May 23rd to Sunday May 30th. Good Luck to All !!! FYI - The necklace to be given away will be a pink background like the one to the right of my blog....just received a Pink one today! !